Gloucester got the better of a watered-down Leicester side to qualify for the Powergen Cup quarter-finals. The Tigers edged the first hour and scored the only try of the first half through Tom Varndell. Gloucester were kept in the chase by Henry Paul, who kicked 10 points during the match. The sin-binning of Lewis Deacon turned the game in the visitors' favour, leaving space for a penalty try and a score by Nathan Mauger. Gloucester director of rugby Nigel Melville described the first half as the "worst rugby I have seen this season". "It doesn't feel like a victory at Leicester," he said. "Our dressing room is very down because we didn't reach the level of performance we wanted to. "The only thing that pleases me is that we won." Leicester boss John Wells had opted to leave out a host of key figures for the tie, among them former England captain Martin Johnson, Austin Healey and Julian White. Despite that, a predominantly young side had the better of Gloucester's more experienced line-up early on. The brightest moment of the first half was Varndell's try after he beat Marcel Garvey to the ball, kicked it off the floor and successfully grounded the ball over the line. Garvey, who did not enjoy one of his brightest days, had a chance to score for Gloucester in the second half only to knock on the final ball. But the error failed to deter his team-mates as Deacon was sin-binned after Leicester deliberately and continually broke up the game. A controversial penalty try for a further Leicester infringement put the Cherry and Whites ahead just before the hour mark. And Gloucester effectively wrapped up the game moments later when Tigers substitute Roger Warren failed to collect a high ball and Paul comfortably sent Mauger through. Leicester boss John Wells said the double win over Wasps in the Heineken Cup this month helped soften the blow. But he said: "The players will be disappointed because there were a lot of young kids who wanted to impress. But Gloucester deserved to win and I hope they go on and win the competition." 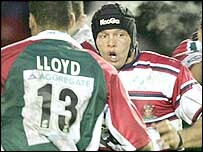 Leicester: Vesty; Varndell, Lloyd, Smith, Tuilagi; Broadfoot, Bemand; Holford, Chuter, Morris; Hamilton, Kay (c); Deacon, Moody, Johnson.